The question asked more than any other…when should I trim my trees? Just as each season has its own characteristics and uniqueness, different species of trees are better trimmed during certain times of the year. 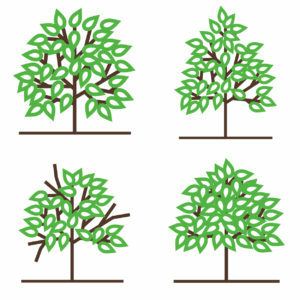 Allowing a tree to use its energy to thrive during active seasons, then trimming during dormant months, promotes longevity and health. Some trees also have tendencies to berry and fruit so trimming during specific seasons can minimize the drop. Other species tend to sap and, depending on the temperature of the day, can create the sap to run quickly. Setting up a full year plan to trim trees in the correct season promotes preserving trees for today and future generations. Most deciduous trees are dormant during the Winter months — this is the season to trim them. The tree has used all its’ energy to produce leaves in the canopy and allowed for photosynthesis to occur. Now that the leaves have fallen, the tree is utilizing stored energy to survive. Another species of tree to trim during the winter months are pines. With the cold weather, trimming pine trees will lessen the sap that will run and the mess that can occur from that. Spring months are when the fruit and berry bearing trees will begin to sprout. Many of these are evergreen trees, meaning they have foliage year round, making it easier for them to thrive. Trimming out the first sprout of berries and fruit can help mitigate large droppings. During this season it’s not advised to trim deciduous trees as this is the time when they begin to use their stored energy to start producing leaves and begin the photosynthesis process again. Trimming during these months will shock the tree and make it begin to try to reproduce more leaves. The lack of energy to produce more leaves will make the tree susceptible to pests and disease. Palms! This is the season to start trimming palm trees. Especially if there are pools and community areas. Seed pods begin to sprout so, trimming the seed pods prior to dropping can lessen an impact in high traffic areas: like pools and parks during the Summer. Seed pods can also stain hardscape, so trimming the pods can help keep these areas clean. Another variety of trees that can be trimmed during this time are evergreen. After heavy rainfall in late Winter and Spring can prompt rapid growth in canopies. This creates heavy canopies which can be thinned during the summer months. The busiest trimming season of the year! Deciduous trees have now used the resources from the photosynthesis process and will begin to turn the shades of orange and red that the Fall season is known for. Once leaves begin to turn, it is the ideal time to trim before they begin to fall and make a mess. Toward the end of the season is also an ideal time to begin trimming pines trees. As the temperatures begin to cool in Southern California, the sap will stay in the trees and not run and drop. One of the oldest trees in Orange County, the Anaheim Unified School District entrusted Great Scott Tree Care to ensure that this Moreton Bay Fig was properly take care of. This historical tree, planted 131 years ago, is located on Euclid Street in the City of Anaheim. With the expertise of the crews and the well-maintained, correct equipment, this was one of the largest trees Great Scott Tree Care has trimmed.